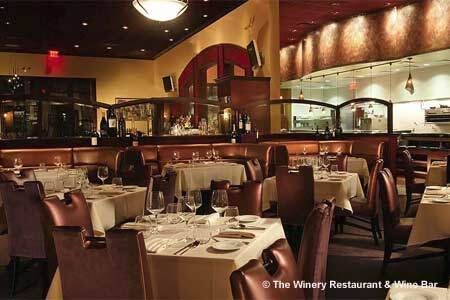 : The Winery Restaurant & Wine Bar brings a wine-focused venue to central Orange County that successfully balances high-end cuisine with a refreshingly unpretentious attitude. The interior features copper-colored banquettes, plush aubergine chairs, mahogany woods and golden walls. For oenophiles, the highlight of the space is the 7,500-bottle wine cellar, humidity- and temperature-controlled for optimal aging. The outdoor patio, which overlooks the monolithic structures of The District shopping center, is set with a limestone floor and accented by stone tables, teak chairs and a double-sided fireplace. The menu by French-born chef Yvon Goetz (formerly of The Ritz-Carlton, Laguna Niguel, Balboa Bay Club and David Wilhelm's Culinary Adventures) boasts a wealth of Cal-French dishes. We recommend starting off with the seared ahi paired with a cool cucumber, mango and avocado tower. For an entrée, the duo of marinated duck breast and crispy duck confit shows off Goetz’s skill in working with the fowl. Go for the seasonal cheesecake with mixed berry coulis or Tahitian vanilla bean crème brûlée for dessert. The lunch crowd should also note that the gourmet burger is worth the price with its Kobe-style beef, bacon, avocado and secret sauce.